Jennifer Aniston’s first grown up watch (her Mickey Mouse timepiece does not count) was a vintage Rolex. In an interview with FHH Journal, the Friends star reveals a passion for Rolex that dates back to her earliest days in the entertainment industry. And her love of Rolex does not stop there. Having said she is not impressed by how much a watch costs, she shows a remarkable taste for the finer models. “My [favorite watch is a] gold Rolex Day-Date President. It’s not a small dial, but what a beauty. In a different register, for other occasions I enjoy wearing my Rolex Milgauss or my white Lady Datejust. No matter what event I’m attending, no matter what I’m wearing, these are watches that never go out of style,” she reveals. 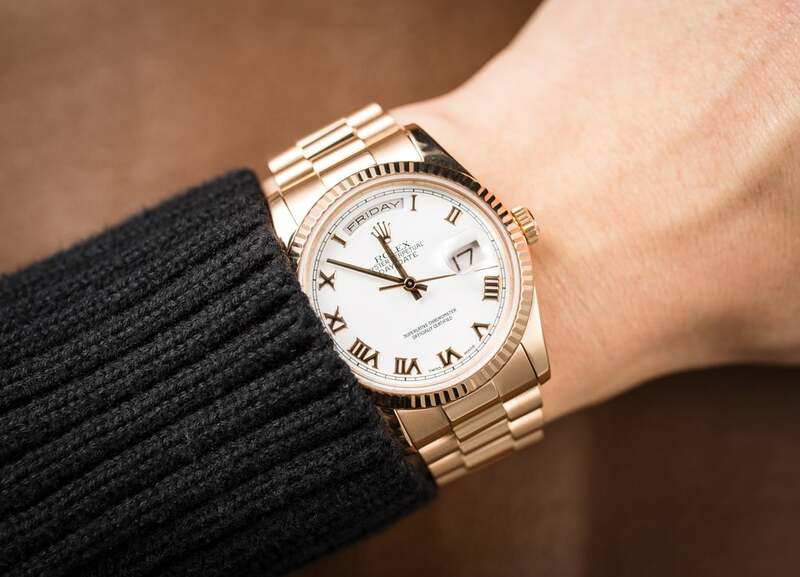 Gold Rolex Day Date President is a timeless classic (pictured watch is not Jennifer Aniston’s). Ms Aniston demonstrates a keen collectors’ eye for fine timepieces but, in an era when Rolex prices are rocketing on the secondary market, does she think of her watches as investments? “Never. I consider the overall aesthetic and I try to imagine myself wearing it in a few years’ time, exactly as I would with a suit or another important item of clothing. I think about how it will weather time. It’s never crossed my mind to buy a watch with the idea that I’m investing in something that will gain in value and make money. Oh, and I could never sell a gift; I’d have too much of a guilty conscience,” she replies. Jennifer Aniston with director Andres Useche and her favourite gold Day Date.